There are times when A Man for All Seasons seems like an older, gentler uncle to George R.R. Martin’s Game of Thrones. (Martin was in part inspired by some of the more salacious and bloody episodes of English history, particularly during the 1400s and 1500s.) One can also see reflections of the current state of American politics in the text. Consider this comment made by the protagonist and title character, Thomas More (Paul Scofield): “But since we see that abhorrence, anger, pride, and stupidity commonly profit far beyond charity, modesty, justice, and thought, perhaps we must stand fast a little - even at the risk of being heroes.” The cynical truth of this observation is fully at home in the 21st century. The 1967 Academy Award winner based on Robert Bolt’s 1960 play, A Man for All Seasons recounts the struggle between Henry VIII (Robert Shaw) and Sir Thomas More during the final years of the latter man’s life. Focused on the king’s desire to marry his paramour, Anne Boleyn (Vanessa Redgrave), and his decision to separate from the Roman Catholic Church, A Man for All Seasons shows the schism that divides Henry from More and the events that lead to the latter’s execution for high treason. Although the film, directed by Fred Zinnemann from Bolt’s screenplay, is faithful in broad strokes to the historical record, it takes notable liberties (although, to be fair, the specifics surrounding individuals and events during the 16th century are at times murky). It’s a tale of politics and how the nobility of a good man can’t stand against the whims of a tyrant. According to the Catholic Church, More was martyred when the executioner deprived him of his head. According to Henry, it was an act of necessity – his former Lord Chancellor and one-time friend had refused to acknowledge his break with the Pope as legitimate and, because More was respected and had influence, his intransigence could foment unrest. (More would neither sign a letter requesting the annulment of Henry’s marriage to Catherine of Aragon nor recite the Oath of Supremacy that set aside the Pope as the head of the Church of England in favor of the king.) The movie dramatizes events in the manner of a Masterpiece Theater episode, with a surfeit of dialogue and one-on-one character interaction. The film’s talkiness is understandable, being based on a stage production, and there’s still room for tension as the point of the king’s metaphorical sword, wielded by Thomas Cromwell (Leo McKern) and Richard Rich (John Hurt), pins More down. In the end, he is faced with a no-win choice: lose his integrity or his head. Acting is one of A Man for All Season’s hallmarks and tremendous performances abound. The cast is loaded with respected names. Paul Scofield (who played the role on stage in London and during the play’s Broadway run) won his Academy Award for this carefully contained performance, which matched the ability to deliver erudite discourse with a sly wit. More’s occasional bursts of righteous anger have power because, for the most part, Scofield portrays him as a quiet, carefully controlled individual. Supporting Scofield, and also Oscar-nominated (although neither won), are Wendy Hiller as More’s wife, Alice, and a blustery Robert Shaw. Leo McKern, TV’s Rumpole later in his life, plays an ancestor to the infamous future Lord Protector of England (a part that, like Scofield, he played on Broadway), and Nigel Davenport is the Duke of Norfolk. Orson Welles, moving into a later stage of his career, has a small role as Cardinal Wolsey, and John Hurt’s appearance represented an early role in a storied career. For her unbilled cameo as Anne Boleyn, Vanessa Redgrave accepted no salary. 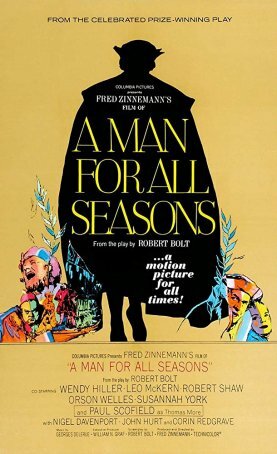 A Man for All Seasons was one of the last highly-regarded films to be helmed by Fred Zinnemann. He won Oscars both for the movie and his direction. It was his second such victory, the other having come for From Here to Eternity. Earlier in his career, which stretched all the way back into the 1930s, he shepherded the classic Gary Cooper Western High Noon to the screen. His follow-up to From Here to Eternity was the musical Okalahoma!, a lighthearted departure from his normally serious fare. With the limited settings and minimal action of A Man for All Seasons, Zinnemann lets the actors take over. The color cinematography is crisp and clean and there are no directorial flourishes. The film’s drama emerges through the dialogue and the interplay between the characters and Zimmermann understood the importance of emphasizing those production aspects. A Man for All Seasons broke the two-year run of musicals winning the top Oscar and marked a turn by the Academy Awards toward serious, prestige films. Although a smattering of comedies and one more musical would be honored over the next decade, A Man for All Seasons augured the direction in which the Oscars would ultimately go – impeccably crafted, “important” motion pictures. Due in part to its period setting, the film has aged well, although this type of drama has slipped out of the mainstream and into the realm of the art-house. A Man for All Seasons offers an engaging, if somewhat dry, history lesson leavened with enough low-key drollness and powerful acting to keep it from ever becoming boring.